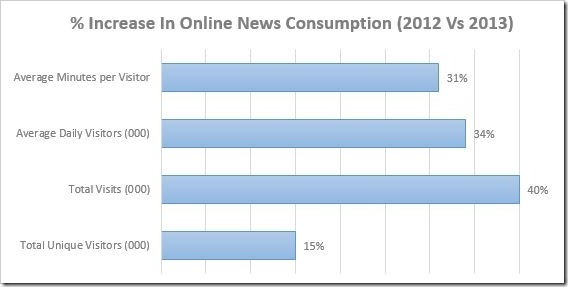 With internet penetration increasing in India, the online news consumption is also on the rise. According to latest comScore report, India’s daily readership of online news and information has increased significantly. It has jumped by 34 percent in past one year.to 9.4 million average daily visitors to this category. The increase is not only in the number of visitors, but also the amount of time spent by Indians on these news sites. The report points that in August 2012, average minutes spent on news sites were pegged at 31.6 minutes as compared to 41.6 minutes in August 2013, an increase on 31 percent! Total user visits in month of August 2013 were 364.6 million as compared to 259.7 million in the same month last year. 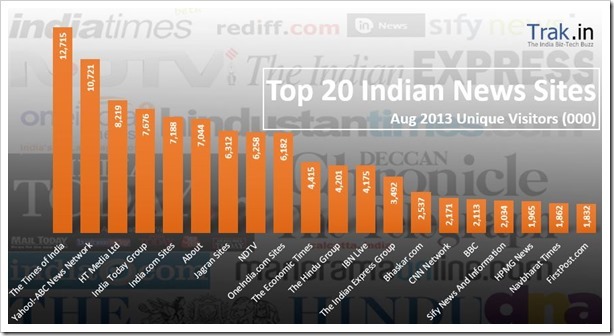 Times of India is the clear leader in the news category with 12.7 million unique visitors in August 2013. They topped the chart last year as well. Yahoo-ABC news network sites came in second with 10.7 mln unique visitors, followed by HT Media sites which clocked 8.2 million uniques in the month of Aug 2013. Interestingly, 16 of the top 20 news sites in India are from local news publishers. India.com sites showed significant 25 percent growth and is now the 5th highest visited news site in India. The report also points to other significant trend – local language site evoke much higher user engagement than english news sites. DivyaBhaskar.co.in and Bhaskar.com demonstrated especially strong engagement at 100.3 minutes and 62.1 minutes, compared to average of 41.6 minutes. FirstPost.com came out on top when it came to news consumption that attracted maximum foreign audience. It registered 51 percent unique visits from abroad with 1.93 million as compared to 1.83 mln from India. It was also the only site which had more foreign audience than from India. 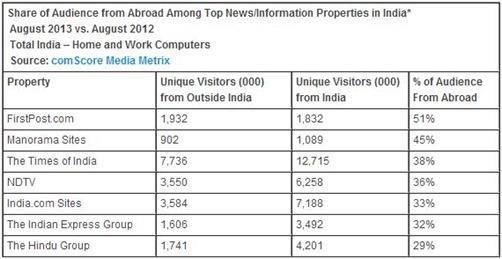 The Times of India also had maximum number of foreign visitors with 7.73 million, followed by India.com sites who had 3.58 mln!